How you can detect if a blog is a dofollow or nofollow by checking the links of a wordpress blog. WordPress blog is a nofollow blog by default. I am sure there are pros and contras out there, and it’s really up to you whether you want to make your blog dofollow or leave it as a nofollow blog. But most of the times, when you are commenting or leaving a link in a blog or website, you also want to know if the blog dofollow. I have posted about what dofollow blogs are in this page. Actually having links in a dofollow higher page rank blog, will help your blog to rank higher too. That’s why people tend to comment regularly in a high PR dofollow blog. And if you don’t know which blogs are dofollow and which aren’t, you can easily check the code source or using firefox addons (i am a firefox user). 1. 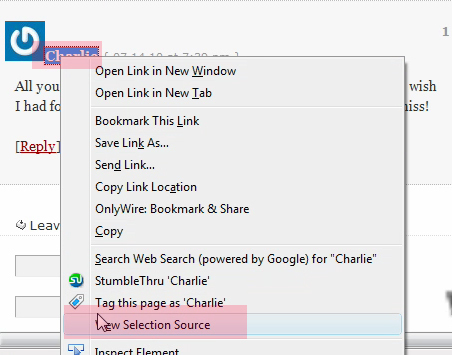 Select the link, right click, and in your browser page’s option, select “View Selection Source”. Select the link, right click. The other way is installing SEOquake firefox addon, and whenever you want to check a link, right click the addon icon in the right bottom of your screen and select “highlight nofollow links”. The result will be red highlighted links, those are nofollow links. @Robyn from Sam’s Web Guide, Thank you for the great input. I absolutely agree with you, firebug is my most favorite firefox plugin. Having do-follow blogs give you advantage to encourage more discussion, because other than commenting people also like to seek for free backlinks by commenting. I’ve just recently started my blog as well with WordPress. This article is very helpful as I’m looking to comment and get the do follow backlink. I’ve just installed the Do Follow and Link Love plugins to WordPress to cancel out the default no follow and reward the commenter with a do follow link, I hope it works! Good luck with it! Thanks for visiting.. The simplest way is to use the Nofollow plugin for Firefox. Thanks for the suggestion froslo. It’s true that firefox plugin is always the best. Anyone knows about chrom plugin for detecting dofollow? I’m a newbie to this. I paid for some links then learned about the “nofollow” issue. Now I’m checking their page source and around my link it doesn’t say “nofollow” anywhere but it does so elsewhere on the page. Even if it is anywhere on the page does that mean all the links on that page are “nofollow”? Or does it have to say that by your link in the page source? I’m not clear on this. I don’t really understand what your question is. If the page source displays rel="nofollow" next to your site’s link then it is nofollow. With a demo site or the site’s link that you refers, it is more easy to investigate. this is helpful to know about the difference between the two dofollow and the nofollow. and i wanna know that your site too the nofollow word is comming in the source option. so i wanna know the real fact about the dofollow and nofollow details. congratulation, your blog is on of the top of google for kw how to check dofollow blog. more chars! what if i did not found my link in the source of page? is that mean it will not be indexed by google? Hi there, it should be detected from the source page. If you provide the link, i will check it for you. nice post, but i am using tool to find it out easily, great read. thanks for sharing the info. Hyey could you tell me adding comment luv my site becomes no follow to follow blog? Commentluv has its own website, i recommend you go there and ask for the support. I agree! Firebug is an awesome addon, love it too cascd! This was a great help. Thanks. i was having dificulties understanding some links and why they were not sending juice to my home page, now I can see why. This will create a nofollow link..
pls told me how to install a tool bar for checking DF/ NF and Page ranks ? this is great , thanks! Great tutoria. Thanks for sharing all this. Looking for a way to detect dofollow blogs and came across your post. Does that Firefox plugin still work with Firefox version 4.0? I am not sure, I do not use FF 4.. I will update the post if I use it. My seo quake doesn’t have the button on the bottom right of the screen that you mentioned. Perhaps that was an older version? I am currently using the newest SEOquake. To get the button, I do “right click” and it shows.. Thank you so much for this article. I was really wondering how to check if a blog is dofollow or not? I’m going to try to SeoQuake now. Thanks again. Great work KIMI,i accept that it is the steps to detect dofollow or nofollow blog. Thanks for this article. It is very useful, hope you will share with us more. thanks for your tutor. Its time my blog is dofollow commenting.so u can get backlink in my blog. Thanks for the post as now i know better which site is dofollow and which is nofollow. so what can i do with no-follow blog???? how can i use nofollow backlink to increase my seo ranking?? Pretty good post. I just stumbled upon your blog and wanted to say that I have really enjoyed reading your blog posts.Any way Ill be subscribing to your feed and I hope you post again soon.Thanks for sharing for writing the great blog info. Thanks for your information. OK, my first assignment -> this blog is no follow? Am I right? i use google chrome, the fastest browser. And there is a chrome extension “NO-Follow options”. It guides me automatically. I do not have to look into codes. Firefox also have this add-on. think it is strange that anyone would put their blog as nofollow as this will discourage people from using it. using source code doesn’t show nofollow but when i use any tools it shows nofollow. Thanks for the post. My site is dofollow, your comments are welcome. Thanks for all the great information. I have never before used Firefox but I will install it right away. Actually for every online business, SEO (Search Engine Optimization) is the core mantra of success in the business. It is the process by which a search engine optimizer brings a business website to rank highly among major search engines like Google, Bing, Yahoo, etc. The process of SEO is very beneficial to drive more and more traffic to a website and that turns in to revenue. Unique content, relevant keywords and link popularity are the major factors to provide high rank in any search engine. This is the first page I found when I searched for “how to check for do-follow blog” on Google. The information is quite correct and I will now use it before posting a comment on any blog. Very nice tutorial. I will use it. I use chrome’s developer extension to check what sort of links they are, and iSEO for chrome to see what PR gets passed. Really though I don’t think it matters too much. Yes! Its true that SEO is the biggest source of income as well as it is the another way to enlarge a Web site’s traffic counts, and eventually conversions, by position very high in the results of searches for the keywords in the search query. It is the mission of SEO to make the site’s content worthy of higher search engine ranking by being more relevant and competent than the competition’s. This is really helpful.. Can you tell me what to do after google panda update… in April 2012. I have no idea how I came upon your blog but it has great information and I am glad I took a moment and read some of your articles. I will be back again to continue to read you blog. Thanks again. it is fast, free and reliable. nice post KIMI, but i am using backlink checker tool to find it out easily dofollow & nofollow link, thanks for sharing the information. thank you for this article kimi, really help me, now I know how to check do follow blogs. Thanks a lot. Helped me out! thank you for the tips.. can we also know the do follow or nofollow backlinks from opera browser??? is there any extension for opera browser to check nofollow? but is your blog do follow? Thanks a lot really helpful article…this is definietly going to help me while deciding comment strategies…. thanks for this great post. i love your blog. 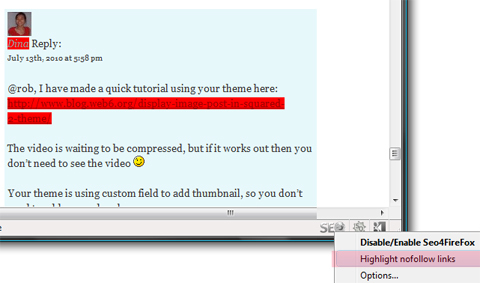 thanks, i love seoquake, it’s an awesome addon, thanks alot. hey have you guys ever tried Dofellow? It’s software that scans and finds do follow blogs. Thought it was pretty cool so I figured I would let you guys know about it. oke thanks for All Information from your blog….